Another set of beautiful blue skies but this time without the nasty cold wind. This was definitely a day for some walking. 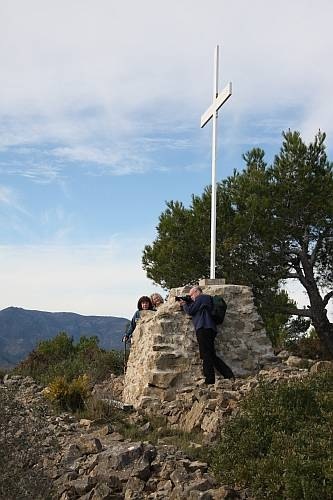 We thought we’d break Steve and Rosemary in gently and take them up to a cross on a hillside overlooking Senija. Carol and I had done this walk before, all the way to the so-called Giant’s Cave. However, the route down from that point was both difficult to follow and seed to us to be a little treacherous, being little more or less than a steep scree slope. Not wishing to repeat our previous heart-in-mouth exercise, we thought we’d simply retrace our steps back down again. Some wisps of thin, high cloud developed but it remained essentially blue as we made our way up hill. Conditions were perfect for walking: not too hot, not too cold. As well as wild thyme and wild rosemary, the hillside is covered with old farming strips divided by stone walls. Sometimes the stone walls are wider that the strips of land which they divide. After passing an old deserted farmhouse and an old well, we soon up by the cross at the summit admiring the views around. 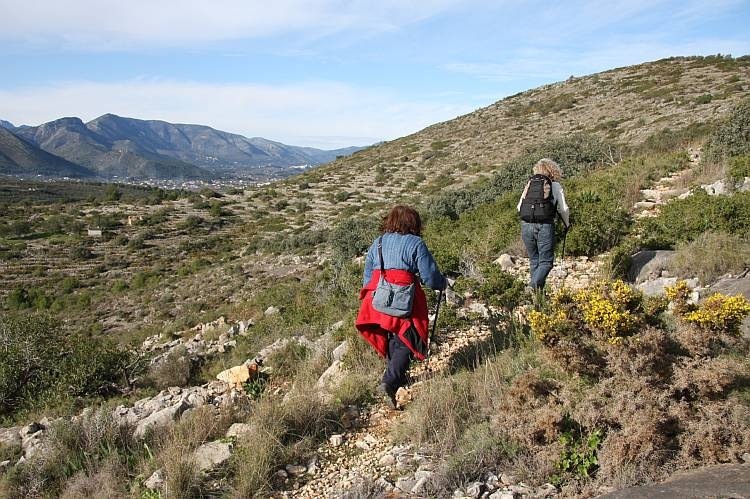 It’s a gentle introduction to walking in Spain which on occasion can be considerably rougher and more severe than anything to which we are accustomed. They must breed walkers tough over here. Our route towards the precipitous descent led us across a narrow lane which seemed to snake its way back down into Senija, so we decided to follow this instead of retracing our steps. Arriving back in Senija I was accosted by a delightful old Spanish gentleman intent on imparting some information which I just couldn’t grasp. There’s something which seems essentially dishonest about stating, in Spanish, that one doesn’t speak Spanish, nonetheless, I tried: “No hablo Español, señor”. Undaunted, he continued to no avail. I really had no idea what he might be talking about. Once again in Spanish, I apologized: “lo siento, señor”, and patted him on the shoulder in as friendly a manner as I could muster. Eventually, both parties frustrated, I suspect, we parted and we continued back to our car. As we were loading the car, our new Spanish friend reappeared, parked opposite and crossed the road to try again. He really was very determined to impart whatever knowledge he found crucial to our wellbeing. He was indicating the hillside from which we had just descended and I eventually twigged that he might be referring to the Giant’s Cave, the very one that we had avoided due to the treacherous scree slope. This time I nodded sagely, muttered something about “gargantua” which seemed to elicit a more positive response, and we parted again much more satisfied. We’ll never really know what he wanted, though.